The best FREE Boxing training program is BACK…… BIGGER and BETTER than ever before! 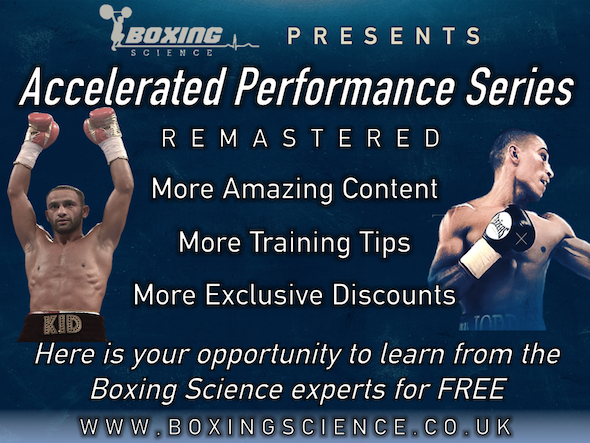 The Accelerated Performance Series – Remastered is a series of FREE weekly newsletters that will give you tips and guidance to help broaden your sport science knowledge to apply to your Boxing and Combat Sport programs. Take a look what we will cover…..
We’ll be sharing some useful information…. like this!! What’s so good this time? If you’re serious about success, you should not miss out on this opportunity. Whether you are a coach, boxer or personal trainer, you will gain so much knowledge from the Accelerated Performance Series. We have spent THOUSANDS of hours and pounds on developing our knowledge, gaining experience, performing research and producing educational tools. We launch in February, and maybe you are buzzing to get started already. To wet the appetite, we have put together a special PRE-LAUNCH BUNDLE to set you on your way…… Totally FREE!